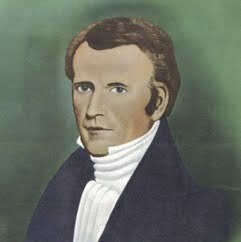 Frederick Granger Williams was an early leader of the Latter Day Saint movement, serving in the First Presidency of the Church of the Latter Day Saints from 1833 to 1837. Williams was born at Suffield, Connecticut, to William Wheeler Williams and Ruth Granger. He married Rebecca Swain in December 1815. By 1828 he was living in Chardon, Ohio, and he moved to Kirtland in 1830. While in Ohio, he associated himself with Sidney Rigdon and the Disciples of Christ. When Oliver Cowdery and other early Latter Day Saints were traveling through Kirtland, they taught and baptized many in Rigdon’s congregation, including Williams. On July 20, 1832, Williams was appointed scribe to Joseph Smith and joined the church’s leading council the next year. He was a member of the committee appointed to publish the Doctrine and Covenants, a portion of the church’s canon, as well as the church’s first hymnal, compiled by Smith's wife, Emma, under the auspices of F.G. Williams & Co. in 1835. In 1837, Williams was elected a justice of the peace in Kirtland, appointed an officer in the Kirtland Safety Society, released from the First Presidency, and moved to Far West, Caldwell, County, Missouri.